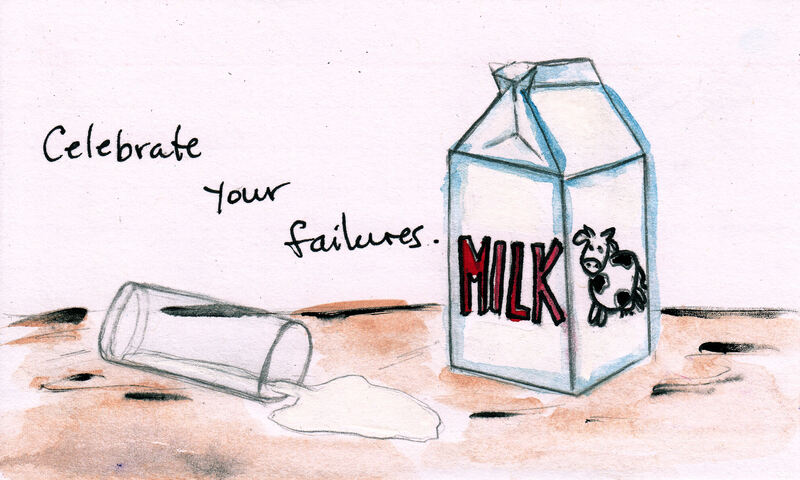 Celebrate your failures, because every time you fail, you learn something. Failing is just part of the process to getting somewhere that you want to go. It’s an opportunity in disguise; an opportunity to learn and try again and try better next time. I’ve been a bit under the weather these past two days, and hence no postings. And in a way it was a failure for me, because I set out on a goal to post every workday, no matter what. I could have just posted a blank notecard with some text on it, to represent failure. But it wouldn’t be trying. And I wanted to try my best, given the circumstances, to illustrate this concept. And perhaps I failed again, but at least there was action behind it. Being someone who always wants to succeed and suffering from a mild case of perfectionism, I have struggled admitting and even embracing failure. It is a long journey, but I am aware and I would rather celebrate my actions, rather than wallow in regret. Don’t be harsh on yourself. Failure is part of the process. Celebrate it. Part of my “Celebration Series”.